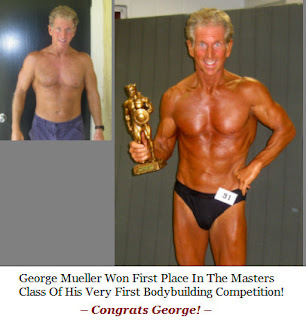 I just wanted to share this awesome e-mail that I got the other day from George Mueller telling me about his experience from his first bodybuilding competition! I just wanted to say a big thank you for all the valuable information that you share on your website, and particularly your new book “Your First Bodybuilding Competition”. 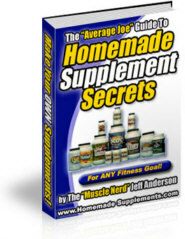 I've been reading fitness and nutrition books all my life and in recent years checking out all the bodybuilding websites online. When I first stumbled upon your website I was very impressed to say the least! I've always worked out and kept myself in reasonable shape year round. But as I was approaching my 60th birthday I decided that was going to do something totally different and really push myself and see what I could achieve. So registered to enter a bodybuilding contest! I knew it would be quite a challenge, but I followed your book to the letter. 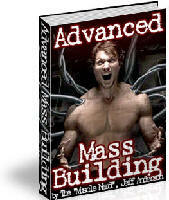 I consider it my Bodybuilding Bible! You covered all facets of competition, from dieting, to posing, and all the fine details of what to do leading up to the contest, and getting ready backstage. It was so in-depth and so complete. You left nothing to chance! When my big competition day rolled around I was in the best shape of my life and ready to show the judges the results of all my hard work. And it paid off for me because I took home the 1st place trophy in the master’s category! George looks better at 60 then most guys do who are half his age. It just goes to show that age is no barrier to building a lean athletic physique. Great job George! You are an inspiration to us all. This is the exact program that George followed to help him win his very first bodybuilding competition at 60 years young! FRICKEN AWESOME! It just goes to show... Dreams never die. 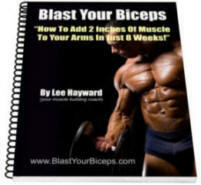 I have your program & I also use some of the info in your course. Best buy ever. At 56 I will never give up weight training. Thanks again Lee. AWESOME! Awesome, congrats to him. His life must be great. Great effort, mate. I am 49 and been weight training since last November and I've never felt better... I have a long way to go but stories like this make it easier to push myself.